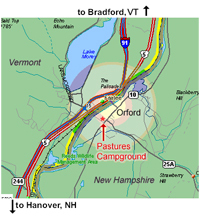 In April of 2010, the NH legislature voted to repeal the unfair and ‘out of the blue’ 9% Rooms and Meals tax they imposed on campers starting on July 1st of 2009. So, to celebrate: Our Rates will stay the same as Last Year! Our rates remain lower than any other campground in this region on either side of the Connecticut River. Last year we remodeled our restrooms and added another piece of playground equipment. Special thanks to those who pitched in, helped set it up, spruce it up and apply fresh paint to it and other play structures. We also added another and larger pontoon boat to or our fleet of rental boat. The Annual Chili Cook- Off on Sept. 12, 2009 was a success in terms of fun and in bringing in just over $600 in donations for World Vision, the worlds largest and most respected humanitarian aid organization. Our VBS held over the Aug. 21-23 weekend was great fun for both children and adults from the campground and surrounding area. So much so, we plan to make it even bigger and better this year. This year we plan to construct three regulation horse shoe pits and begin hosting tournaments both for campers and guests. The first event will be held on Saturday July 3rd. and then again on Sunday Sept. 5th. Stay tuned for more details. Volunteers welcome to mix, pour, and trawl for a work date to be announced! The Orford’s River Jam concert series has retired after a long, but fun run of ten consecutive years. The cost- to- benefit ratio, the amount of time and work required, and the selective and yet varied musical taste of our campers are all factors in this decision. However, it is largely due to the ever increasing licensing fees charged by BMI, ASACP, and SESCAN. Don’t get Byron started talking about what he calls, “the music mafia”!! This does not mean there will be no musical entertainment on Saturday nights, popcorn, and lemonade. However, the format and frequency will change to include less formal gatherings of singer song-writers sharing their original music and campfire sing-along events. Schedule to be announced and posted on our web page. The 4th falls perfectly on a Sunday and the parade starts at 11AM. It’s always a hoot to watch or participate in. You can enjoy it all from the roadside or find room to ride on our ‘float’ we all decorate together just in time! Be prepared to sing and have a great time as we roll along. Lake Morey will have a fireworks display again this year starting at about 9 PM, mostly visible from our campground. Reminder: Fireworks are not allowed in the campground. The excitement and fun begins on Wednesday at 10AM in the Pavilion. The staff will include over 20 young adults and teens from Living Rock Church in Killingsworth, Conn. Starting each day at 10AM, children from all over the Upper Valley area are invited for a full day of exciting activities including Bible stories, group games, great music and group singing, prizes and awards, and hand craft projects. On Saturday evening at 7:30 PM, everyone of any age is invited for an evening of special music, skits, awards and great fun. 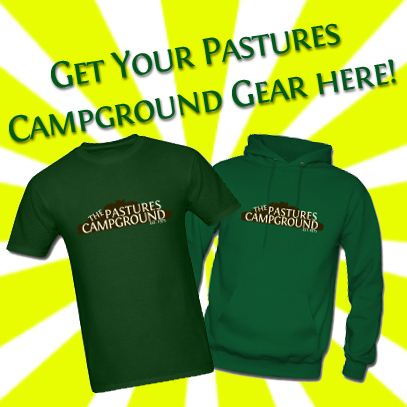 Pastor Wayne and Peggy Lydem, seasonal campers and pastors of The Living Rock Church in Fairlee, VT, will also be conducting their regular Sunday service in the Pastures Campground Pavilion at 10:30AM. All are welcome. An old fashioned “Sunday School Picnic will be held about 12:30 complete with hot dogs, burgers, and all sorts of tasty goodies …free of charge with lots of food, fun and fellowship for all. Everyone is invited. Starting at 11AM, fine entrees of chili cuisine in various categories from campers will be judged as they are sampled by all who attend. No fee is required this year for entering a crock-pot of chili. A $5 donation will be received in exchange for a ticket to sample all the many Chili entries. No one went away hungry last year. Proceeds go directly to benefit World Vision to provide humanitarian aid to people in need such a Haiti and other developing countries. Serving usually start about 5:30 PM, or when the pig’s goose is cooked! The Pastures supplies the roasted pig (done on the premises for your added entertainment value!) and includes: rolls, drinks, salad, and eating utensils. Campers and their guests are encouraged to bring along their own favorite side dishes or desserts to share pot luck style. Cost: $5 per person, $2 for children age 12 and under. (Rain or shine). Special Musical, Entertainment and Inter-active fun to follow the meal. Mel Pierce has logged over 901 miles over the past two seasons in walking the perimeter of the campground to maintain his youthful figure. Art Kidder, long time seasonal camper, passed away in April. Both he and Lois will be missed.